There is all sorts of misinformation about braces and the orthodontic process floating around online, and this can sometimes make people avoid treatment altogether, or relapse treatment they’ve already had. 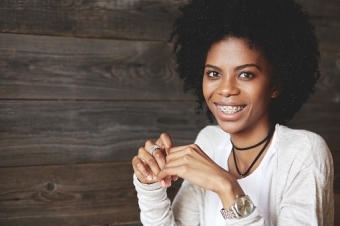 Here, we’d like to clear up 4 common myths about braces. 1. Braces are for aesthetics. A stunning, uniform smile is undeniably an enormous benefit to getting orthodontic treatment. But, there are many health benefits to orthodontic treatment too! Straight teeth are typically much easier to clean and maintain than misaligned teeth, since there aren't as many crevices for food particles and plaque to build up in. These crevices can also be difficult to reach with a normal toothbrush, and so cavities can form rather easily in these spots. Misaligned teeth can make eating certain foods more difficult, and the uneven grind pattern they create can cause an uneven wear. 2. Braces are for kids and teenagers; I want to straighten my teeth, but I’ve missed my chance. Anyone with healthy teeth can benefit from orthodontic treatment! Age isn’t a barrier to orthodontic treatment. The fundamental process that allows teeth to move and change position is the same for people of all ages. More adults than ever are choosing to undergo orthodontic treatment these days, and since, there are many low-profile, virtually invisible braces options available, you don’t have to worry about looking unprofessional or 'too young' in your day to day life. 3. Rubber bands are the least important part of my treatment, so I don’t really need to keep them on all the time. Although they’re not made of metal like many of the other parts of your braces, rubber bands play a highly important role in your orthodontic treatment. The rubber bands move your top teeth and your bottom teeth in relation to each other, so that they sit comfortably together, improving your bite. To make sure your treatment goes according to plan, you must wear your elastic bands full time, as prescribed. Otherwise, you’re just stalling your progress! 4. My teeth have shifted after treatment. This means my orthodontist didn’t do a good job. Just because you've worn braces in the past, there's no guarantee that your teeth won’t shift out of position over time. This is why you have your retainer! Just after your orthodontic treatment is complete, you'll wear your retainer full time. Once your orthodontist says so, you can move to part-time, but you should always wear your retainer, at least periodically. If you have questions about facts vs. fiction when it comes to braces, contact LangleyOrthodontics today!